Staff file photo by Doug Strickland / Board member David Testerman, left, listens to board member Tiffanie Robinson in a September school board meeting. This story was updated May 16, 2018, at 11:28 p.m.
Several days after two Hamilton County school board members denounced a UnifiEd plan that calls for desegregation of district schools, other school board members have spoken out — and so has a county commissioner. 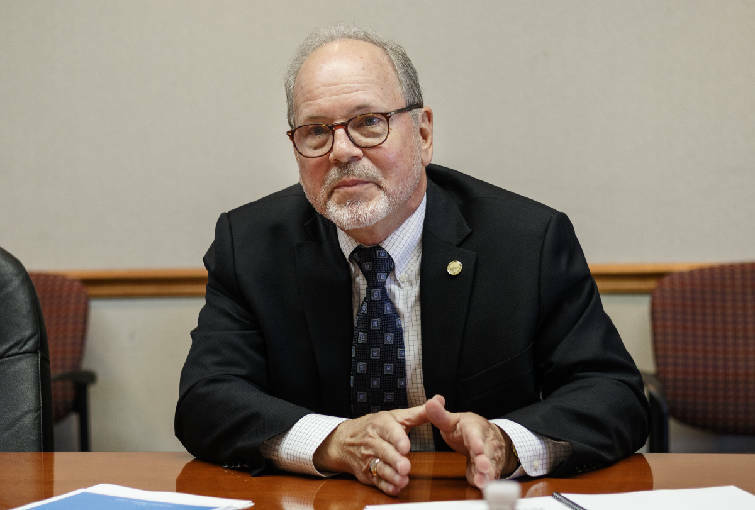 During the county commission meeting Wednesday morning, Commissioner Tim Boyd, of District 8, addressed the local education organization, the separate political action committee and its Action Plan for Education Excellence, at the crux of the controversy. Hamilton County Commissioner Tim Boyd speaks about his plan to reallocate $4 million from the county budget during a meeting with the Times Free Press editorial board on Wednesday, March 29, 2017, in Chattanooga, Tenn.
"UnifEd is using students in the Department of [Education] as a crutch for their political agenda. This is not an organization pushing for better education, it's an organization pushing to change the profile of Hamilton County, our way of life and the way we continue to go do good work in this county," Boyd said. "This report doesn't suggest things, doesn't recommend things, it demands things, and the word 'must' ... [appears] 54 times telling elected officials, community leaders, people on this dais, that we must comply to this document. I'm offended by it, I don't endorse it, I don't think the people of this community endorse it." Last year, UnifiEd, an education advocacy organization, launched the APEX project. It aimed to survey the community about its priorities and eventually develop a policy platform that candidates could endorse and that would recommend solutions and best practices for improving education in Hamilton County's public schools. The organization presented the report to the school board in April. It suggests the district increase integration in schools by redrawing attendance zones, increasing magnet school options or even implementing open enrollment, and providing more adequate transportation for students to attend their desired or zoned schools. Boyd encouraged "every elected official and every individual that has any conservative views in Hamilton County" to read the report, saying it was the "most far-left, liberal document [he's] ever read." His statements echoed the sentiments of Rhonda Thurman, of District 1, and Joe Smith, of District 3, the board members who released a statement last week calling out the report. "[UnifiEd] hasn't considered the cost of doing anything," Thurman noted in last week's statement. "This is my county, I don't need liberals from out of town coming here telling me what's best for people in Hamilton County and ordering me to tell the County Commission to take more money from taxpayers." Smith also pitted conservatives against the organization, which he accused of involving itself in the nonpartisan school board race through the creation of its political action committee, Unified Action PAC, last fall. "They're sticking their noses in what's supposed to be a nonpartisan race," Smith previously told the Times Free Press. "What we ought to be talking about is what's best for our schools." Other school members have since spoken out against Smith and Thurman's statements, though many have been silent. 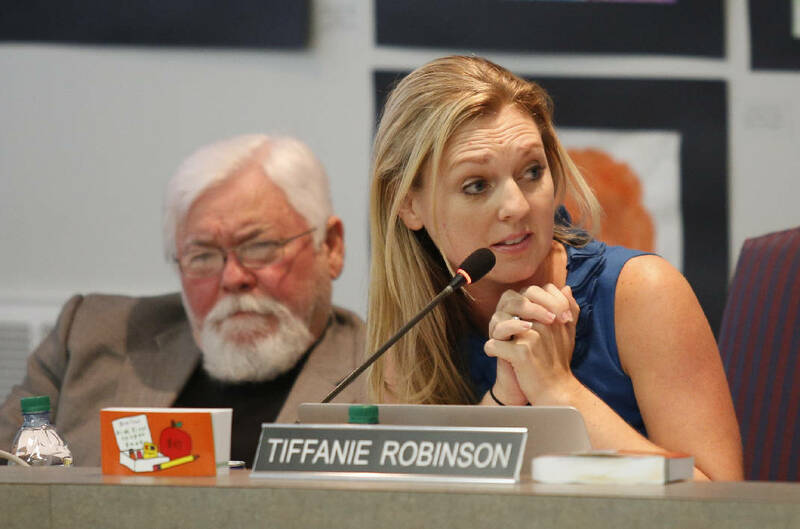 On Tuesday, both Tiffanie Robinson, of District 4, and Kathy Lennon, of District 2, released statements to their constituents. "Since last Friday, I have been called on by many to issue a statement on the heated rhetoric between two critical camps in our county's public education ecosystem. I have, so far, withheld public comment, instead choosing to talk with my constituents in District 4, so I can better understand their thoughts and feelings," Robinson said in a statement. "In one of those discussions, a parent asked me, 'Whose side are you on?' My answer, to them and the rest of Hamilton County, is that I'm on the side of our students and their families. I always have been, and I always will be." Robinson also acknowledged that "the concept of busing — an unsuccessful policy of the past — has not been advocated by anyone in close relation to the Hamilton County Department of Education." She did add that new transportation options might be needed to address inequities in county schools. Robinson also called out what she called the "politicization" of the debate. "Simply put, it has no place in the discussion and needs to stop immediately," she said in a statement. "Ending school segregation is a nonpartisan matter, and we should all refuse the politicization of this debate. Politicization creates unnecessary roadblocks keeping us from resolving our most pressing needs, and we don't need to build any more barriers — we inherited enough." Lennon echoed many of those sentiments, citing frustration with recent conflicts and emphasizing her desire to be "responsive and receptive to students, teachers, parents, business leaders, partnerships, and the community at large." "We have an obligation to acknowledge inequity and explore solutions. And work together to effect change that will benefit us all," Lennon said in a statement. "The inequities that affect our schools must be corrected for the benefit of every single student. We can't close our eyes to that."